Breathing safely... Fire safety is of great interest at present. Fast and efficient action is, of course, of vital importance. Preventive measures such as smoke detectors, fire blankets and fire extinguishers all play an important role. Nevertheless experience shows that it is the strong smoke fumes at the start of a fire which leads to most fatalities. 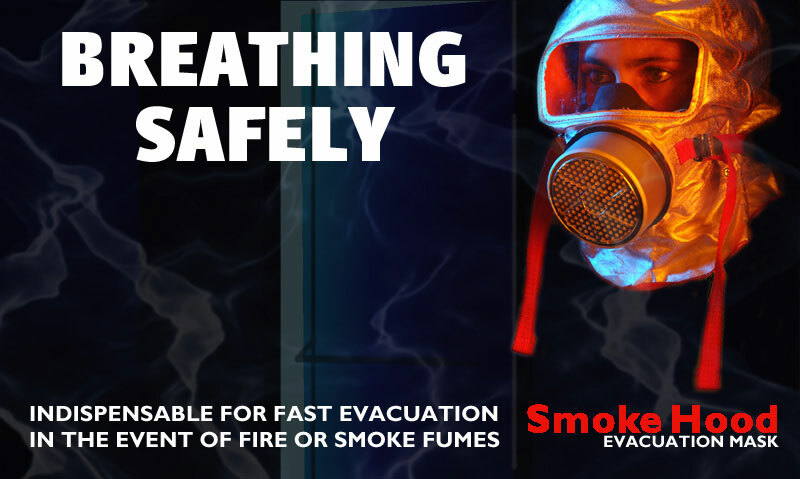 Smoke in the eyes, disorientation and the escape of poisonous gases hamper attempts to leave a building in time. The Smoke Hood evacuation mask helps to keep one's head cool. Moreover it is indispensable for a fast and a safe evacuation in the case of fire or smoke fumes. The Smoke Hood is resistant to a heat of 800 º Celsius. Thanks to the heat-resisting visor the wearer's vision remains unaffected. Thus the building can be left without panic. EUROPEAN APPROVAL... The Smoke Hood evacuation mask offers at least 15 minutes protection against the fast smoke fumes and all escaping toxic gases according to the EN403 norm. The mask has been tested extensively. It actually tested to over 60 minutes and conforms to the strict conditions of the European Standard EN 403:1993-5. The first purifying layer filters the smoke and soot particles. In the second purifying filtration part the poisonous gases are stopped. Then remaining carbon monoxide is converted into carbon dioxide by means of a catalyst. A final layer will then absorb this chemical element. Within seconds one can breathe again safely. SAFE SELF EVACUATION... Recent figures show that annually dozens of people die in fires. Moreover hundreds of people with serious injuries will have to be hospitalised. The Smoke Hood may change this. The evacuation mask is appropriate for single only. The filter is guaranteed for five years after production. The presence of the Smoke Hood is reassuring. However, by no means it is meant to replace the task of the professional fire brigade. The Smoke Hood only procures a safe and fast self-evacuation. At home and at school, in offices and workshops, discos, hotels, health centres and other places where many people meet. For international truck and bus drivers (tunnels) and businessmen (hotels) the presence of a Smoke Hood can be of vital importance.